Hayfield Country Show revisited | Holly's Footprint..
One week on from the first day of Hayfield Country Show and it still feels exhausting looking back. Exhausting but very satisfying. We had a very good turnout and the weather could not have been better, both for us and the many thousands of people who visited over the weekend. Many people have said “well done” directly to Debbie and myself, and we’re thankful for the compliments, but I worked out we had about 30 people directly involved with manning the stall and selling quizzes and raffles around the ground. When you also take into account the huge number of people who baked for us plus the many who came and bought things, it is clear that the weekend was a community effort. And not just Hayfield – a great number of Holly’s friends and their families from Hope Valley took part too. That collective effort brought in just over £1600 for the two days which is astonishing. Considering that most of the cakes were priced in pence rather than pounds, £2 for face painting, £2 for Quiz Sheets and £1 for the raffles… this is a great achievement for everyone involved. So we thank each and every one of you who helped in whatever way. 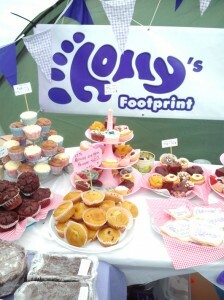 And while we’re on the subject of thanks it would seem like a good time to say thank you to Andy Heath, Natalie Lancaster and Nicki Lowe who are the other ‘official’ members of Holly’s Footprint. Without your help and hard work none of this would have been possible so Debbie and I are eternally grateful to you all.